I've been hearing quite a lot about the new CW teen drama Riverdale, which premiered last week on Thursday (January 26), so I decided to check it out—and I was pleasantly surprised. 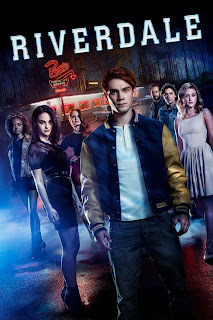 Based on the popular Archie Comics characters, the series is set in the fictional small town of Riverdale, where the mysterious murder of rich kid Jason Blossom takes place on the Fourth of July. As it becomes evident within the first few minutes of the pilot episode, Riverdale takes a dark, noir, and subversive spin on the original comics, earning comparisons to shows such as The CW's own Gossip Girl, Pretty Little Liars, and Twin Peaks. The young cast consists mostly of fresh, relatively unknown faces. New Zealander K.J. Apa plays Archie Andrews, a popular, all-American jock who struggles to balance football, his father's construction firm, and his newfound passion for music. 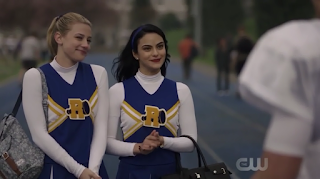 Wholesome, girl-next-door Betty Cooper, played by Lili Reinhart, is Archie's childhood best friend, and harbors a longtime crush on him. Camila Mendes makes her acting debut as reformed bad girl Veronica Lodge, who has just moved to Riverdale from New York with her mother Hermione (Marisol Nichols), following her wealthy father's incarceration for fraud and embezzlement. With her raven-haired beauty and big-city smarts, Veronica is already my favorite character. As soon as Archie sets eyes on Veronica for the first time, there's an undeniable spark between them, but once Veronica learns that Betty has feelings for him, she encourages her new friend to go after him. Still, I can totally see this love triangle causing these two girls to become frenemies at some point. 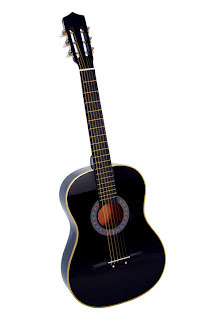 If that wasn't enough, Archie also had a summer fling with the school's young, attractive music teacher Miss Grundy (Sarah Habel)—and while the two were making out by the river the morning Jason disappeared, they heard a gunshot (!). Does this remind anyone else of Gossip Girl's Blair and Serena? Cheryl Blossom (Madelaine Petsch), Jason's twin sister, is Riverdale High's entitled, manipulative queen bee and cheerleading captain. Their relationship borders on creepy, to say the least—she even refers to him as her "soulmate" at one point. Strangely enough, it was after an early-morning rowboat ride with Cheryl that Jason disappeared and was eventually found dead. It's safe to say that she seems to know more about her brother's death than she's letting on. Ashleigh Murray is Josie McCoy, the lead singer for Josie and the Pussycats, now an all-black girl band. The main cast includes some familiar names as well. Cole Sprouse (one half of the Sprouse twins) returns to acting as Jughead Jones, a brooding loner writer and Archie's former best friend—details of their estrangement have yet to surface. Betty's overbearing mother, Alice, is portrayed by Mädchen Amick, perhaps best known for her role as waitress Shelly Johnson on Twin Peaks. Luke Perry, AKA Dylan McKay from Beverly Hills, 90210, plays Archie's father, Fred. For many years, The CW was the go-to network for soapy teen dramas, including the iconic Gossip Girl, 90210, and The Vampire Diaries. However, once the genre saw a ratings decline, the network has switched its focus to superhero shows such as Arrow, The Flash, and most recently, Supergirl. I'm confident that Riverdale has the potential to restore interest in the coming-of-age, high school-set teen drama genre. Sadly, the series premiere drew a measly 1.38 million U.S. viewers. The first season will consist of 13 episodes, but hopefully the show will stick around for a lot more, now that I have a new show to obsess over! If you're looking for a new show as well, I highly recommend you tune in on Thursdays at 9 p.m. ET. Outside of the United States, Riverdale is now available to stream on Netflix in select regions. I think its a remake of an old show? You know I watch everything on internet now I am thinking to get spectrum cable to watch all series regularly now I have much time to do this.